Our stock is already in Europe, in Belgium, so no hidden costs like custom's fees, taxes and also no certification problems:our products are CE certified WITH Declaration of Conformity ! Payment: by bank transfer, IBAN and BIC communicated . Will connect to any FrSKY SmartPort equipped receiver or sensor, like X8R receiver and FVAS-02 alti/vario sensor. 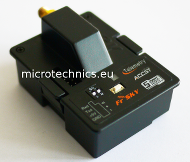 Compatible with FrSKY D16 Mode and LR12 mode. When inserted in Taranis external slot the XJT will add 16 channels to the internal module 16 channels for a total of 32 channels. Smart Port enabled, realizing two-way transmission. Detect the module antenna’s working status and give sound warnings if the module antenna is broken or does not have intact contact, etc. Super lower latency (approx. 1/3 of current systems) and higher precision (transmitter’s hardware and software support required, such as ☆ FrSky transmitters). No telemetry with this receiver. More channels from conventional channel outputs: 1~9ch , 1~12ch from SBUS port. With RSSI output: analog voltage output (0~3.3V). Longer operating range: two time the operating range of V8 or D series. As from October 16th 2014 these sensors are sold with last Software dated Oct 10th 2014. Only Sensors showing manufacture date from April 2014 till September 2014 should be upgraded. 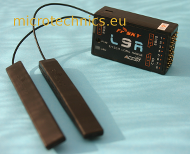 Used with TARANIS transmitter from FrSKY, it will also give you an audible indication of R/C or R/D, like in full scale sailplanes. 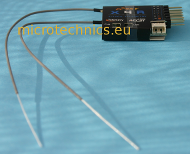 Can be connected directly to Smart Port of the new FrSky telemetry receiver X8R or to Data Port of D8R and D4R-II receivers. Altitude will show in meters or in feet, selectable. Used with TARANIS radio from FrSKY, it will also give you an audible indication of R/C or R/D, like in full scale sailplanes. For Altimeter and Variometer display. Number of channels: 1~6ch Smart Port enabled, realizing two-way fast transmission. Number of channels: 1~3ch from conventional channel outputs. With RSSI output on board: analog voltage output (0~3.3V). Smart Port enabled, realizing two-way fast transmission. Smart Port enabled, realizing two way fast transmission. Will connect to any FrSKY SmartPort equipped receiver or sensor, like X4R, X6R, X8R receiver and FVAS-02 alti/vario sensor.